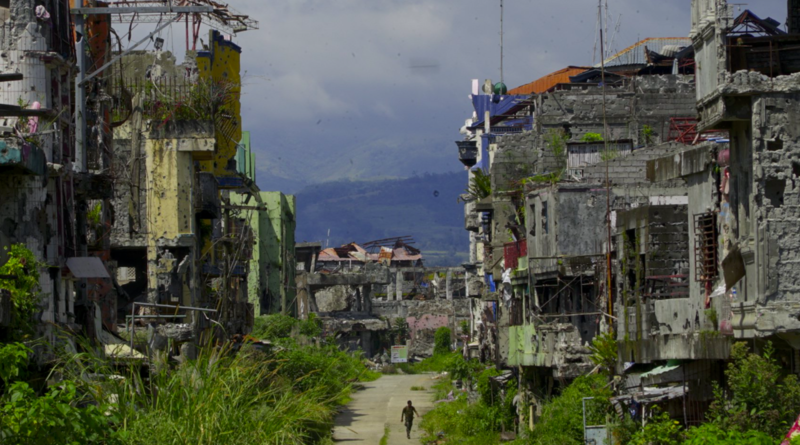 The war-ravaged centre of Marawi City. Photo by David Lipton, via Twitter. The US has pledged 3.2 billion pesos to the rebuilding of Marawi City, which remains in ruins more than a year after it was liberated from Islamic State-linked terrorists. The US Embassy yesterday (Wednesday, October 17) confirmed an extra 1.35 billion pesos under its Marawi Response Project, which will offer micro grants to displaced communities. During and after the conflict between government forces and terrorists last year, USAID provided humanitarian and early recovery assistance to Marawi returnees, as well as displaced and host communities. Among these are the ongoing improvement of water, sanitation, and hygiene activities in Lanao del Sur, amounting to 338 million pesos; the 100 million-peso project to deliver 1.8 million kilograms of rice to displaced families; the restoration of access to markets and provision of essential maternal, newborn, and child health training and supplies for affected populations worth 431.6 million pesos; and 480 million-peso allocation to work with vulnerable populations, including youth, to enhance their job skills. In education, the US government has employed the “Empowering Madrasa Educator” programme, as part of its 70 million-peso rosters of education, economic development, youth empowerment and countering violent extremism outreach programmes in response to the Marawi crisis. Days before the commemoration of the Marawi siege’s conclusion, US Ambassador to the Philippines Sung Kim also launched the Empowering Madrasa Educator 2 worth 12.7 million pesos which provides intensive long-term training to 175 madrasa educators and 25 madrasa administrators from Marawi, Lanao del Sur, Cotabato City, Maguindanao, Isabela City and Basilan. Through the programme, madrasa educators will improve their English proficiency and computer literacy. The US also continues to help the Armed Forces of the Philippines in quelling militants, including support that increases intelligence, surveillance, and reconnaissance capabilities. On October 17, 2017, President Duterte declared Marawi City liberated from “terrorist influence”. Then, on October 23, the government officially announced the end of hostilities. The five-month conflict led to the deaths of 168 government troops more than 900 militants, including their leaders Omar Maute and Isnilon Hapilon. A ground-breaking ceremony for the city’s reconstruction was due to be held yesterday. However, as we reported on Monday, this has been postponed until October 28.